Parker Laboratories, Inc., one of the world's largest manufacturers of ultrasound couplants, manufacturers POLYSONIC® Ultrasound Lotion, a cosmetic quality lotion with ultrasound transmission capabilities of a gel. POLYSONIC has been formulated to provide superior sound wave transmission and the pleasing appeal of a fine cosmetic lotion. This multi-purpose lotion is hypoallergenic, bacteriostatic, non-staining and will not damage expensive equipment. 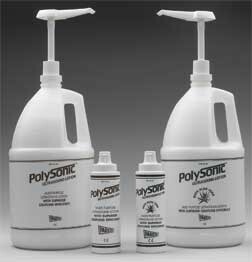 POLYSONIC Ultrasound Lotion is recommended for all medical ultrasound procedures. It can be removed with a towel or massaged into the skin, leaving it soft and smooth. POLYSONIC is also available with aloe vera. For further information or a complimentary sample, contact your local distributor or Parker Laboratories, Inc. at 800-631-8888. Parker Laboratories, a leading manufacturer of ultrasound and electromedical contact media, has introduced a 7" by 10" textured, Protex™ ULTRA Disinfectant Wipe. With its new formulation, Protex ULTRA will eliminate 99.9% of bacteria in 15 seconds and disinfects in just 4 minutes. The 7" by 10" textured wipes are safe for most hard surfaces and are useful on ultrasound transducers, athletic equipment, countertops, as well as vinyl exam tables. Protex ULTRA Disinfectant Wipes can be used in medical offices, hospitals, exercise facilities and locker rooms. Effective against 40 different pathogens, Protex ULTRA blends versatility and improved kill-time. Protex ULTRA is available in 60-count softpacks, 12 per box, as well as in 100-count canisters, 6 per case, through medical supply distributors or by contacting Parker Laboratories, Inc., at 800-631-8888 or online at www.parkerlabs.com.